Corporation Review | RPG Review Cooperative, Inc. Corporation is released by Mongoose Games, under their Flaming Cobra of independents, in this case, Brutal Games. It's a beautifully bound hardback, absolutely rock solid in production qualities and lies quite flat when opened. The 256 page text is two column justified, sans-serif (not a good look for print, great for online), with boxed page numbers and chapter titles in the modest margins, top right and top left respectively. This is supplemented by boxed italic text providing short, descriptive narratives, and sectioned text to highlight specific rules. 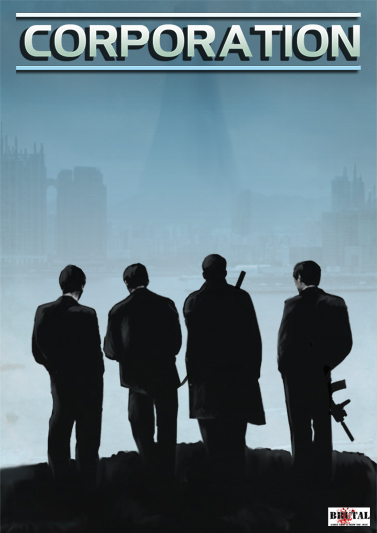 The cover is simple but evocative, a group of four Agents (think covert ops, men in black etc) overlooking a misty river with a spire and an old city in the background. The internal art is competent and evocative, presenting the cyberpunk and special agent setting which is central to the game. Unfortunately the printing is far too dark and much of the detail of the internal artwork has been lost in production. I've been told the clarity of the artwork is superior in the full-colour PDF version of the game. The book is broken up into thirteen chapters, made explicit by a very clear two-page table of contents, with a three page index supplementing. After a brief introduction the game dives right into Character Generation followed by four chapters assisting the process (Equipment, Cybernetics, Telepathics, Character Advancement), and two chapters of central setting information for characters (The Corporations, the UIG and the Order of the Truth Faith). It is well into the book (chapter 8, p137) until the actual game system is explained, and this brief chapter (13 pages) is followed by supplementary setting information for the next three (The World in 2500, The Cities, People and Places). The last two chapters are GM aids, including sample scenarios and sample NPCs (Running Corporation, Antagonists). Character generation is based around building an Agent who works for one of five corporations, of which selecting the first part of character generation. Naturally enough it is expected that all PCs join the same corporation and each party has a Division Leader. The five corporations are Ai-Jinn (effectively China), Comoros (Indo-Africa), Eurasian (Europe, Russia), Shi Yukiro (Japan), Western Federation (US etc). Each corporation has its own particular benefit and specialisation; the Western Federation, for example, specialise in military equipment, the Comoros in telepaths etc. The second step is concept (a broad description of what the character is, e.g., Detective, Morale Officer, Weapons Scientist). This will help define a professional skill for the character. The seven stats (Agility, Endurance, Intelligence, Perception, Presence, Reflexes, Strength) are assigned either by allocating 7 points to each and then adding or subtracting on a 1-to-1 basis with a maximum of 10 and a minimum of 5, or, 49 points with the same minimum or maximum. Yes, that is the same thing. There are also derived stats for Hit Points, Telepath Energy etc. One key feature to note at this point is that the Agents are about 50% better than normal humans in all regards. Agents also have Conviction, which provides a bonus in desperate situations. Skills are assigned with pre-determined levels (1 at level 8, 1 at level 7, 1 at level 6, 3 at level 5 etc), which makes generation a little faster in play with some loss of flexibility. The list of some twenty-five skills comes with fairly minimal description, with the occasional mention of modifications. PCs will start with at least some level of learning in around 80% of the listed skills. In addition to skills there are some thirty-five trainings, specialist areas of expertise, of which half are combat-based. Most of these are all-or-nothing affairs (e.g., Advanced Disarm, Defensive Fighting etc). In a latter chapter the seven skills dedicated to telepathic powers are described; these are evaluated by level and are powered by recoverable telepathic endurance points. As initial equipment, Agents are able to purchase licenses, provided by the United International Government. These often come with skill level and rank prerequisites, and are used for carrying particular equipment (e.g., Heavy Firearm License), having particular authorities (e.g., Public Appropriation License), are particular professions (e.g., Preachers License). More mundane equipment is valued according to quality and covers an expected range of weapons (lots of these, many pages), armour, toxins and drugs, and a range of "general equipment" (environment suits, toolkits, translators etc), process and task chips (which provide skill bonuses), and a handful of vehicles (but including mecha!). A short chapter is dedicated to cybernetics, particularly notable for providing the capacity to raise stats over 10 and being susceptible to EMP. Different companies dominate parts of the cybernetic market in a form of monopolistic competition, such as Anascan for optical technologies, Datanetica for field processing and so forth. Character advancement is through rank points, experience points and mission pay. Rank points are determined by the corporation, the UIG or a combination thereof, and is used to gain licenses, vehicles, housing, improve in the hierarchy and so forth. Experience points are awarded by the GM for "good roleplaying" at a rate of 3-5 per session; these are used to improve skills (costing at current rating), stats (double current rating) and the like. Agent level is an abstract value based on experience points. Mission pay is based on rank times base mission pay with a bonus based on relative success; the Comoros pay the worst, the Eurasians the best. 'Downtime' is a period between missions, which gives the opportunity to improve equipment, gain mission rewards, and possibly receive punishments. The game system is based on 2d10 roll under Stat+Skill, with doubles providing criticals with a success and fumbles for a failure. How much the roll is made by determines the degree of success and with generic modifiers given a bonus from +4 (very easy) to -12 (nearly impossible). When carrying out actions, skill and stat are loosely coupled. Combat is summarised as encounter-based initiative (d10 + reflexes), 'to hit' rolls based on the mechanic described above, roll damage, subtract armour. There are spot rules for move/attack combinations, mixed attacks (e.g., close versus ranged), criticals, damage types, evasive action, called shots, severed body parts (based on static hit point target numbers) etc. By way of example, a large pistol does d10 damage, and a knife does d4+Strength (which is oddly higher on average than the magnum); the average agent will have around 35 hit points. Characters are incapacitated at zero hit points, and begin to lose a point of Intelligence every round to represent brain death. Also included in the game system chapter are other nasty world effects (drowning and falling, fire and poison etc), along with brief rules for vehicle maneuvers and operating system-based (rather than social engineering) hacking. Setting information makes up the bulk of the book, starting with the corporations (chapter 6) and the UIG and the Faith (chapter 7). The short background is that corporations grew very large, powerful and monopolistic in the 21st and 22nd century and eventually engaged in a destructive war with each other. From the ruins came the United International Government, as the corporations had exhausted themselves. Other significant changes include the discovery of artificial intelligences on Venus which aided the UIG and have since been released into the world net, and seem to behave quite benevolently. Each corporation is described in some detail with a basic description, goals, culture, operational method, typical names and ranks, occupations, sub-sects, example characters and unique abilities or equipment. Each corporation has nearly monopolistic control over a particular area of life; so Ai-Jinn has the mining and macrostructure pretty much under its control, whereas Eurasian has health and leisure. Despite their low rate of pay, it is likely Comoros (telepaths, education and culture) will be a popular support among PCs as they have the most noble goals and history. Overall - and this is high praise - the Corporations summary chapter reminded me somewhat of the classic Cults of Prax, but in a vastly different setting. One may add to this the discussion of the Order of the True Faith, a Buddhist-derived religion based on telepathy, eschewing technology, with the objectives of eliminating poverty, crime, corruption and dehumanisation. In comparison to the corporations, the UIG remains a Archon (AI) backed, if not controlled, organisation. UIG operatives receive quite an array of specialist equipment and legal protections. Whilst nominally a democracy (citizens do have the right to vote), the UIG also has a policy of 'Depersonalisation', whereby breaching serious laws will cause one to lose citizenship status and become property - open for slavery, organ-harvesting, whatever. Given that the UIG was established and imposed after a destructive corporate global war this policy should be questioned; whilst perhaps thematically appropriate and a handy plot-device, post-war governments tend to be more liberal - indeed, popular opinion is often towards the radical. It is the build up to war where the forces of reaction typically gain gain ascendancy. Setting information is supplemented by a world-overview which provides a discussion of typical communication systems, sample mundane goods and services, travel (intercontinental skybridges, teleport stations), foods (vat grown), and sports (including the extremely violent, and downright silly, 'wetball', gladiatorial games and legal duelling), crime and the environment (significantly colder due to the Corporate War, lower biomass). Computers and artificial intelligences receive special mention for the Minerva project, an AI which, in its quest for self-preservation, destroyed most of France. Cities receive their own chapter, especially dedicated to the elite Spire Cities, corporate-gated communities, the shanty-town Underswells, and 'Relic Cities' of the Order, and the wrecks of the Old Cities. A "People and Places" makes up the final setting chapter. This includes a list of the minor corporations in existence, minor regions (such as lawless Australia), off-world entertainment and research centres, academies, the machina cult and the driod liberation army. The latter represents as close at the setting gets to a discussion of politics. The final two chapters are GM aids. The first of these is for running a game of Corporation, and contains some good advice for running games where the PCs have multiple loyalties, mission and plot development, a collection of 100 mission ideas, five sample mission outlines, and a range of sample installation floorplans. The final chapter, Antagonists, provides as expected a range of sample characters including Mutated Humans, Civilians, Scientist/Doctor, Bounty Hunter, Outlaws, Security Guards, UIG Officer, Devotees of the Order, various Agents and even droids. Each of these is provided in full-page write-ups, sample art, and a alternatives. It rather reminded me of the AD&D 2e Monster Compendium in layout. Corporation is a solid product. It is well made, well presented, and sticks to its theme and setting. There is an excellent density of useful information throughout the book. The game system, whilst not providing anything that is ground-breaking new, is largely consistent and coherent. Setting-wise the overly strong cybernetic rather than biotech orientation, and a rather far-future date of 2500 serve raise some concerns, but these are relatively trivial to a game which shows that cyberpunk, as a gaming genre, still has a lot to offer.